The sporty and refined, all-new Fiat Cronos recently made quite an impression on car buyers in Brazil and Argentina, and is poised to give competitors in the compact sedan market a run for their money. “Development of the Cronos was based on a comprehensive study of the needs and desires of Latin American consumers, who are increasingly demanding when it comes to technology content. The studies showed that buyers in the compact sedan segment are mostly married, have at least one child, travel constantly with the family and have one car only, which must meet certain fundamental requirements, such as spacious interior and baggage area, comfort and safety. Design, performance and fuel economy also have a significant influence on the purchase decision,” according to FCA. Car buyers in Latin America have the choice of two intense engines that both boast a FCA technological patent — a 1.3-liter Firefly and 1.8-liter E.torQ EVO. Each engine can be paired to an automated GSR Comfort, manual, or six-speed automatic transmission. The stunning compact sedan features a spacious 525-liter trunk, a standard Uconnect 7 multimedia infotainment system as well as technologies designed for superb handling and control: traction control (TC), electronic stability control (ESC), Hill Holder (HH), and electric power steering. Other standout features on the all-new Cronos include Keyless Entry ‘N’ Go, LED signature position lights and headlamps, glare and twilight sensors, puddle lamps, and Start&Stop technology. 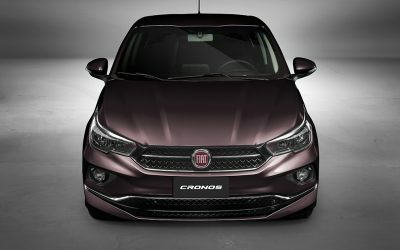 The Fiat Cronos will be manufactured at FCA’s Cordoba industrial complex in Argentina.